The Enterprise is in shaky orbit around a planet, rocking back and forth like a seafaring vessel as “ripples in time” from the surface wash over the ship. An explosion at the helm knocks Sulu unconscious and McCoy is summoned to the bridge to administer medical assistance. He gives Sulu a small dose of “cordrazine,” a powerful and dangerous stimulant, which revives him in a very good mood. Another time ripple rocks the ship and McCoy accidentally empties the entire hypospray of cordrazine into his stomach. He immediately flips out, ranting “Killers! Assassins!” and fleeing the Bridge. The drug has driven him mad, with the paranoid delusion that people are trying to kill him. He attacks the Transporter Chief and beams down to the planet to escape. Uhura loses contact with the Enterprise and they realize that McCoy has somehow altered the past, eliminating their timeline and trapping them on the planet. Kirk and Spock have no choice but to leap through the portal into the past, striving to put right what once went wrong. Since Spock recorded the whole thing, he knows roughly when McCoy entered the Guardian, and they time their jump so they will arrive shortly before he does—if they’re lucky. They land in an alleyway in Depression-era New York. Their bright Starfleet uniforms and Spock’s pointed ears stand out in 1930, even in Manhattan, so they’re forced to steal some contemporary clothes from a fire escape, elude a policeman, and hide in the basement of a building. There they make plans to find McCoy, hoping that the flow of time, a temporal “backwash” (ew! ), may bring them all to the same time and place. Uncertain of where or when he will arrive, or how he’s changed history, Spock will need to build a computer to access the images recorded in his tricorder. Suddenly they’re discovered, but it’s okay because it’s a beautiful woman and Kirk has charm to spare in any time period. He tells her that they were hiding after stealing clothes because they have no money, and amazingly she offers them work: cleaning and washing at “fifteen cents an hour for ten hours a day,” which will allow Spock to purchase the vacuum tubes and parts he needs. They introduce themselves and she tells them she’s Edith Keeler, manager of the 21st Street Mission. One day soon man is going to be able to harness incredible energies, maybe even the atom. Energies that could ultimately hurl us to other worlds in some sort of spaceship. And the men that reach out into space will be able to find ways to feed the hungry millions of the world and to cure their diseases. They will be able to find a way to give each man hope and a common future, and those are the days worth living for. Our deserts will bloom. She’s either a prophet or a science fiction fan, but either way Kirk is smitten. He finds her “most uncommon,” and she apparently feels the same about him. She finds them a room in her building for two dollars a week, which Spock promptly fills with electric contraptions in his efforts to “construct a mnemonic memory circuit using stone knives and bearskins.” He’s forced to “borrow” some tools from a clock repairman for a night, and Edith confronts him over the theft. Kirk defends his claim that he was going to return them by morning, which distracts her—she’ll drop the matter if Kirk will walk her home. She’s curious about him and wants some answers. By the time Kirk gets back, Spock has gotten some answers of his own from his tricorder. He’s found two contradictory newspaper articles: an obituary indicating Edith died in 1930 from a traffic accident, and a headline dated six years later, describing a meeting between her and President Roosevelt concerning World War II. Edith is their “focal point in time” and McCoy is “the random element” that will affect whether or not she dies. They need to determine which event is supposed to happen before he arrives, but Spock must first fix the burned-out circuits to coax more information from his tricorder. Oh, I’d give a lot to see the hospital. Probably needles and sutures. All the pain. They used to hand-cut and sew people like garments. Needles and sutures. Oh, the terrible pain! When McCoy passes out, the homeless man steals his phaser and manages to disintegrate himself. Well, no one will miss him at least. Meanwhile, Kirk and Edith are becoming romantically involved, though the captain is tortured by the idea that she might have to die. The next morning, McCoy stumbles into Edith’s missionary and she bustles him off for some rest, just missing Spock in the cafeteria. We’re not that sure of our facts. Who’s to say when the exact time will come? Save her, do as your heart tells you to do, and millions will die who did not die before. Meanwhile, Edith has nursed McCoy back to health, and he thanks her for saving his life. He’d like to return the favor, but it’ll have to wait until after her date with her “young man.” She hopes Kirk will take her to a Clark Gable movie, but the actor’s name doesn’t ring a bell with McCoy. 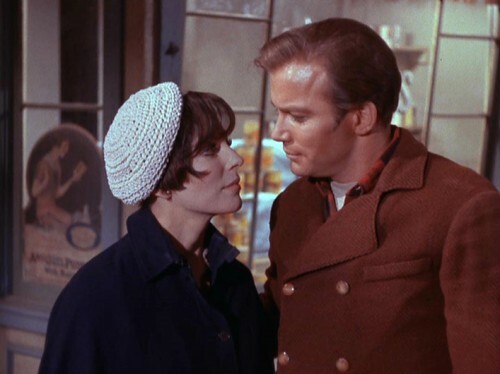 Kirk doesn’t know it either; when he asks her about it on the street, she says, “You know, Dr. McCoy said the same thing.” Amazed to hear that McCoy is in the Mission, Kirk leaves her on the sidewalk and runs across the street, yelling for Spock. McCoy appears at the door and the three of them have a joyous reunion, cut short when Edith starts to cross over to them, right into the path of an oncoming truck. Kirk heads for her but stops when Spock reminds him that he musn’t save her: “No, Jim!” McCoy also rushes toward her, but Kirk grabs the doctor and holds him back, eyes squeezed shut in agony, allowing Edith to be struck and killed. McCoy is horrified. MCCOY: You deliberately stopped me, Jim. I could have saved her. Do you know what you just did? SPOCK: He knows, Doctor. He knows. Back in uniform, Kirk and Spock leap back through the Guardian followed by McCoy, only a moment after they left. Their mission was successful. GUARDIAN: Time has resumed its shape. All is as it was before. Many such journeys are possible. Let me be your gateway. UHURA: Captain, the Enterprise is up there. They’re asking if we want to beam up. KIRK: Let’s get the hell out of here. This is one of the highest-praised episodes of Star Trek, for good reason. Privately, I’ve been holding this one as my ideal for the Warp 6 rating. I was mildly worried it wouldn’t hold up as well as I remembered, but it remains an incredible episode, often imitated but rarely surpassed in science fiction in any medium. Even without the soft focus lighting, from the moment the talented and beautiful Joan Collins appears in this episode, it’s obvious that “The City on the Edge of Forever” is a love story about Edith Keeler and Jim Kirk. With the SFnal problem of the damaged timeline to contend with, unfortunately this will be a brief and tragic affair; the spaceman from the future and the woman who is ahead of her time are as starcrossed as two lovers could be. We have often seen Kirk’s dalliances with women before, but this relationship is handled differently. They flirt delicately, and in the moment that they finally acknowledge their feelings, we are deprived of witnessing their first kiss. Later, when they kiss again, it’s gentle and sweet, with Edith taking the lead. These kisses are far from the passionate lip-locks we’re accustomed to, distinguishing their relationship as something special… perhaps something purer. As far as we know, it isn’t even consummated. Indeed, Kirk infrequently invokes the word “love” in connection with a woman, and the scenes of them strolling hand-in-hand through the streets of New York with “Goodnight Sweetheart” playing in the background could have been lifted from any romantic film of the 1930s. It’s the believability of their relationship, the strength of Kirk’s feelings for Edith, and her compassion and goodness that give the ending so much emotional weight. If Kirk’s moral quandary and the painful resolution were all that this episode had to offer, it would still stand above many others, but there’s so much more making this an enjoyable and provocative story. The tragedy is balanced with some of the best comedic moments in the series, from Kirk’s explanation about Spock’s accident with the mechanical rice-picker to every line McCoy utters to Edith once he’s regained his mind and manners. MCCOY: I’m a surgeon, not a psychiatrist. I am Leonard McCoy, Senior Medical Officer aboard the USS Enterprise. EDITH: I don’t mean to disbelieve you, but that’s hardly a Navy uniform. MCCOY: It’s quite all right. It’s quite all right, dear, because I don’t believe in you, either. The episode ends on a somber note, perhaps a bit abruptly, but I think it’s fitting. Though outwardly “all is as it was before,” Kirk was deeply affected by his experience. He isn’t the same man he was at the beginning of the episode. They beam back to the Enterprise and leave the Guardian as they found it, alone in the ruins of an empty world. The barren landscape and the Guardian’s lonely existence hint at a dark history and implies that the time portal is not as much a boon as it might seem. There was only one real sour moment in the episode, when Uhura deadpans “Captain, I’m frightened,” after discovering their past has been erased. This is a perfectly understandable sentiment given the circumstances, but the delivery was a bit off. Other than some nitpicky questioning of some minor plot elements (such as why they are unable to simply scan for McCoy and beam him up from the ship), this is a perfect episode all around. Torie Atkinson: I know this one only by reputation, and all the praise is earned and then some. It’s a tour de force. This is, for all intents and purposes, a perfect episode. I love Kirk and Spock’s friendship so much. They get frustrated with each other, but they have so much respect and admiration for one another. It’s priceless when Edith calls Spock on it: “Captain. Even when he doesn’t say it, he does.” They know just how to get each other through. When Kirk jokes that Spock must not be capable of creating the tricorder device, it’s exactly the nudge the man needed. His place is by Kirk’s side, Edith says, and she’s right. I was reminded of STII, when Kirk realizes that Spock is no longer on the Bridge beside him. It is that moment, that realization, that hits Kirk like a blow. You can feel and see that here—the strength that neither could muster without each other. Their friendship competes with the relationship that blooms between Kirk and Edith. For the first time, we see a woman that Kirk could really love. She shares his same idealism and optimism, the same certainty that the future holds nothing but promise, and the same confidence that no obstacle is too large to overcome with the right amount of determination. I delighted in the way she saw through all of Kirk’s lies. He can’t put anything past her. And without Kirk’s ship, without his responsibilities, there is nothing to stop them. He gets a slice of a normal life, and letting that go—letting her go—is devastating. Joan Collins surprises no one by being radiant and astounding, but Shatner really pulls off something special here. He conveys so perfectly a man burdened by the knowledge that the one person that could make him happy must die. After Spock shows him the evidence, Shatner turns away and walks toward the camera, and you see tears in his eyes. When the time finally comes, he cannot watch, and then runs behind a corner, shaking, fists clenched. I teared up then and I tear up now just recalling the scene. He conveys that loss with such emotional power. I can think of few contemporary “romantic” films that comes close to expressing what he does. Her optimism is the optimism the show often expresses: a belief that one day they’ll “take all this money they spend on war and death” and, as Kirk says, “spend it on life.” But Spock somberly reminds us that that was not the time for peace. The maturity of that statement really struck me. Peace is not a panacea to the evils of men—rather, there will be a time for it, only when men are ready to accept it can they truly move beyond their own motivations. It made me wonder what happened to the world the Guardian of Forever is on that left such a wasteland of ruins. I think my favorite part was when Kirk watches the Guardian speed through the newsreels of history. He notes how compelling the urge is to “lose oneself in another world.” They, too, are watching television, and in a way they stand in for us as viewers. Star Trek is the world in which we lose ourselves and dream that dream. It’s a beautiful metaphor for the power of image and art to create the impossible. We will always dream and yearn for other worlds; it makes us human. Star Trek—especially Star Trek like this—gave us a little piece of that dream. EDITH: Why? What is so funny about man reaching for the moon? KIRK: How do you know? KIRK: And make them spend it on life? EDITH: Yes. You see the same things that I do. We speak the same language. 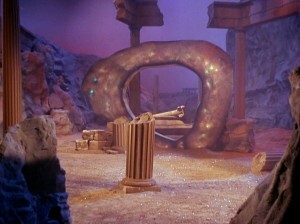 Trivia: Not just arguably the best episode of Star Trek, which won the 1968 Hugo Award for Best Dramatic Presentation, this is also the most controversial, owing to the changes from Ellison’s original script (itself a winner of a Writers Guild of America award) and the final version, as well as ongoing legal battles over the use of the Guardian of Forever in merchandising and other Star Trek stories. In his draft, a druggie named Beckwith traveled back in time to Chicago via the technology of an alien race called the Guardians of Forever. Kirk was unable to let Edith Koestler die, and Spock had to step in to prevent her from being saved. Other notes: The New York sets used in this episode were previously used for the town of Silsby in Superman and the Mole Men (1951) and the streets of Metropolis in the first season of the Adventures of Superman (1952). The Guardian of Forever appears again on screen in the animated series episode “Yesteryear,” and is also featured in many tie-in novels and stories. Next Episode: Season 1, Episode 29 – “Operation: Annihilate!” US residents can watch it for free at the CBS website. This post originally appeared on Tor.com. EUGENE MYERS has published short fiction in a variety of print and online zines as E.C. Myers. He is a graduate of the Clarion West Writers Workshop and a member of the writing group Altered Fluid. When he isn’t watching Star Trek, he reads and writes young fiction. His first novel, Fair Coin, is forthcoming from Pyr. TORIE ATKINSON is a NYC-based law student (with a focus on civil rights and economic justice), proofreader, sometime lighting designer, and former Tor.com blog editor/moderator. She watches too many movies and plays too many games but never, ever reads enough books. Not only were the street sets used in the productions mentioned above, they were also seen in “The Andy Griffith Show” as part of Mayberry. In particular look for ‘Floyd’s Barber Shop’ as Edith and Jim begin their strolling conversation. There is also an amusing ( and almost ironic – considering the story ) anachronism seen in one fleeting shot: After Rodent ( the homeless man, as he was named in the script ) vaporizes himself with McCoy’s phaser, an establishing shot of the brownstone where Kirk and Spock are staying is seen ( at about 38:03 in the episode ). At the far right of the scene you can clearly see a 1950’s era Civil Defense Fallout Shelter sign posted on the side of a building. Apparently someone else in that neighborhood also had knowledge of future events!